Whether you’re redecorating your home, changing up that old carpet for warm hardwood flooring, or just longing for a fresh coat of paint and some new accents in the living room, the design trends this year are all about texture, style, and surprises. It’s hardwood floors celebrating knots and imperfections or variations in plank sizes and color. It’s wood on your walls and faux stone tile backsplashes. It’s mixing unexpected materials to create an entirely new look. Mix, match, and mosaic is what it’s all about this year. Earth tones are big this year in everything from accent pieces to linens and walls, to flooring. Think natural-colored solid hardwood and rattan dining chairs. Also on trend: breezy, uncomplicated seaside styles that incorporate natural aquatic blue and green shades. 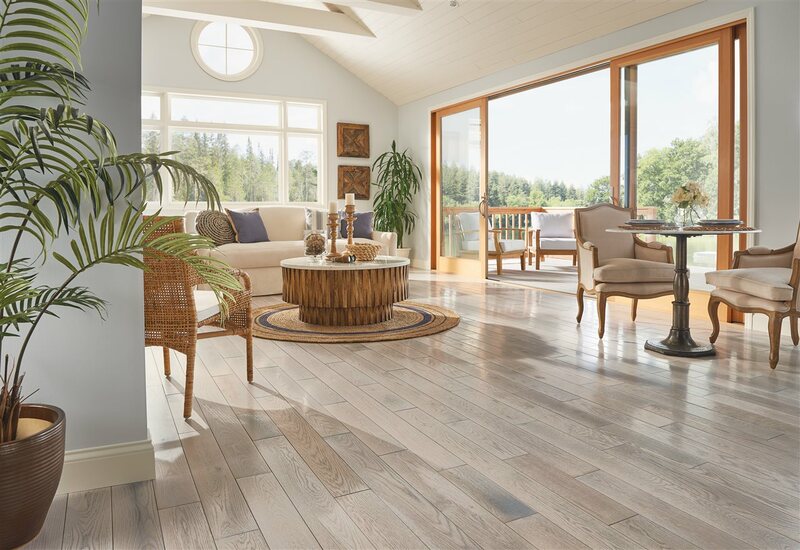 “We are seeing an ode to the elements in interior design — walls and flooring that look distressed or weathered, and an ongoing demand for the look of reclaimed wood,” says Babinski. Also on tap this year is mixing metals, especially in the kitchen. “Warm-toned fixtures can now live harmoniously with stainless appliances and with the latest appliance trend — a beautiful black finish! Copper, rose gold and oxidized metals are especially popular,” Babinski says. Also in 2018, patterns are meant to be broken, especially in floors. Herringbone-patterned flooring is trending, and floors will incorporate different colors, textures, glosses, plank widths, and lengths.